Pennsylvania accident attorneys know all too well the dangers that pets can pose to innocent people. Pet owners have the responsibility of ensuring that their pets do not cause harm to anyone. Sadly, some pet owners are inexperienced or negligent. And, they fail to keep an eye on their pets. More often than not, pet owners fail to train their dogs properly. A badly-behaved dog, or a dog who is not properly restrained, may be prone to biting strangers or even people it knows. And in some cases, dog bites can be even more dangerous than car accidents. They can cause serious and painful injuries. That is why if you or someone you love has been bitten by a dog, you should get in touch with an experienced Philadelphia dog bite attorney right away. Attorney Joel Kofsky, a premier Philadelphia injury attorney can help you get the settlement you deserve. Not every dog is dangerous and prone to biting or attacking people. Most dogs are very friendly and safe to be around. But even a dog that doesn’t have a mean streak or violent tendencies should be kept well-restrained around members of the public. It’s the owner’s responsibility to prevent the dog from attacking or biting someone. Unfortunately, not every dog owner is careful about restraining or keeping an eye on their dogs. They assume that since the dog has never bitten or attacked that it is a sweet dog. Therefore, the are a bit more relaxed watching the dog. This is a common occurrence in dog bite cases in PA.
Also, some dogs break out of their fenced yards and attack people passing by. In some extreme situations, these dogs bite or maul innocent victims. These can cause severe injuries that require the help of a knowledgeable PA dog bite attorney. The CDC estimates that around 4.5 million dog bites occur each year in the United States. And, one out of every five dog bites becomes infected. Even worse, of the 800,000 people in the U.S. who are treated for dog bites each year over half of those victims are children. Young kids have a much harder time recovering quickly from their injuries. Both adults and children can suffer severe and painful injuries if they have been bitten by a dog. The primary medical concern after a dog bite is that the wound will become infected. Infection can cause further issues like unexpected illness or even death in some cases. All of these injuries must be given immediate medical attention. They may even require ongoing medical care and physical therapy. Many victims also suffer from emotional trauma after being bitten by a dog. This is why contracting a top-rated PA injury attorney is important. While this medical care is necessary, it does not always come cheap a dog bite victim could end up paying hundreds or even thousands of dollars in medical expenses solely to treat one dog bite. In these situations, a qualified Philadelphia dog bite lawyer can help you receive compensation for your injuries from the attacking dogs owner. The statistics reveal that most dog bites occur from dogs that we are familiar with. But these accidents can also happen with strange dogs as well. Common places include your neighborhood or parks or other public areas. If you encounter a dog that seems like it is unfriendly and might attack, there are a few steps you should follow. It is important that you teach your children these rules as well so that they can protect themselves against dog bites. Do not approach an unfamiliar dog without asking its owner’s permission and without someone watching the dog at all times. Do not disturb a dog that is eating, sleeping, or taking care of its puppies, which might provoke an attack. Do not run from an unfamiliar dog or a dog that seems likely to attack. Instead, remain motionless. If the dog knocks you over, curl up into a ball by tucking your head and covering your ears and neck with your hands. If you see a dog acting strangely, be sure to contact law enforcement and alert the dogs owner. If you or a loved one is attacked by a dog, the very first thing you should do is to seek medical attention for your injuries. A doctor will be able to help treat the bite and will try to ensure that any infection that has happened does not go any farther. Once you have been treated by a doctor, contact the office Joel Kofsky so that we can send a qualified PA dog bite lawyer to your hospital room or your home for a free initial consultation about your case. The attorneys who practice with Joel Kofskys top rated PA injury law firm understand how upsetting, and scary a dog bite injury can be. We want to ensure that our clients are compensated for their injuries from the dogs owner. After all, the owner is responsible for the dogs behavior. That is why one of our knowledgeable PA injury lawyers will work with you to file your claim. We will make sure that your rights are protected as you recover from your dog bite injuries. When a dog owner fails to supervise or train his or her pet properly, the dog owner is putting members of the public at risk of harm. If you were attacked or bitten by someone elses dog or pet, the owner should be held legally accountable for your injuries. Pennsylvania law governing dog bites, however, is somewhat complicated and requires the accident victim to prove several things for the victim to be fully compensated for their injuries. The general rule is that a victim can recover full compensation for his or her injuries if the attacking dog had previously bitten another person without justification, or if the dog had demonstrated a tendency to bite without reason. 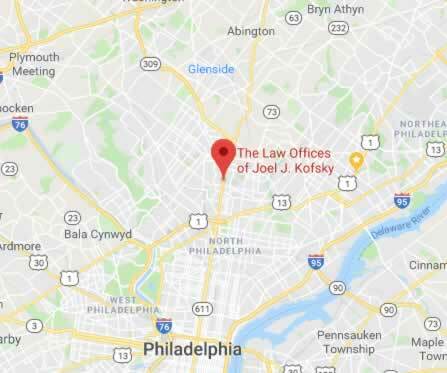 With Joel Kofskys highly skilled PA legal team on your side, the best Philadelphia dog bite attorneys will help investigate your case and determine whether the dog who attacked you had previously bitten anyone else or whether the dog had shown a tendency to bite. Severe injuries such as broken bones, disfiguring lacerations requiring multiple sutures or cosmetic surgery give you the right to file a suit against the dogs owner. You can seek compensation for your medical expenses and any other legal damages that were incurred as a result of the attack. If you elect to hire Joel Kofsky, Philadelphias premier accident lawyer, our team of top rated dog bite lawyers will help you prove that the dog attacked you without being provoked. We only work with the best injury attorneys in PA to help you establish your proof that you did not provoke the dog before being attacked. If your injury is not severe, however, your claim against the dog owner will be limited to only covering your medical expenses. Again, our highly knowledgeable Pennsylvania injury lawyers will help you gather your medical records and bills to support your claim. The team who works with Attorney Kofsky will help you determine whether your injuries are considered severe under the law. Another difficulty in your case may be trying to establish who owns the dog. In some cases, the owner of the dog is clear. But sometimes people keep dogs that they do not own on their property or refuse to claim the dog as their own once they learn that the dog has attacked someone. The PA injury attorneys who work with Joel Kofsky will help you investigate who the dogs owner is so that you can file your claim and recover against the proper party. If your attack was the dogs first time biting someone, to prove your claim for damages against the dog owner, you will need to show that the dog owner behaved negligently. You will also need to show and that his or her negligence caused your injuries. For example, if the dog was not properly confined in the yard before it attacked you, you will need to demonstrate that the owner negligently failed to restrain the dog. The Pennsylvania injury lawyers at the law firm of Joel Kofsky have experience with negligence claims against dog owners. We know how to demonstrate that the dog owner acted negligently, which ultimately caused your injuries. It is critical that you contact one of our Philadelphia dog bite attorneys as soon as possible after your accident. By law, these kinds of claims must be filed within two years of the attack. However, while this may seem like a long time, it becomes harder to prove your claim as time goes by. Records may get lost, people may confuse details of the attack, and you may not have access to the information you will need to prove that the dog had bitten someone before or that the dog owner acted negligently. Our team of top notch PA accident lawyers knows that you need time to recover from your injuries. Let the team from the law firm of Joel Kofsky step in right away to help you with your claim. Our experienced Pennsylvania injury lawyers can get the legal ball rolling so that you can focus on getting better. Our Philadelphia injury attorneys have years of practice handling dog bite cases in the Philadelphia area. We work passionately on behalf of our clients in order get them the compensation they are owed for their injuries if they have been attacked or bitten by a dog. 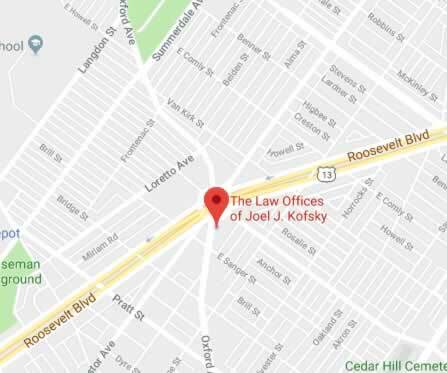 Reach out to the team at the law firm of Joel Kofsky, the best PA injury attorney, for a free consultation. We wont take any money without first settling your claim and getting you the compensation you deserve.